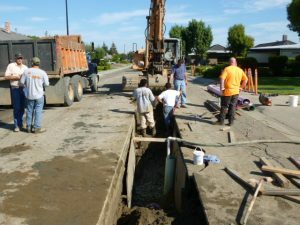 Traditional sewer line replacements are notoriously expensive, and the subsequent renovations required after the excavation is part of what makes the dig-and-replace method so cost-prohibitive. At Nu Flow St. Louis, our team is trained and qualified to help home and business owners avoid the mess and high costs of dig-and-replace pipe repairs by offering intuitive alternatives to the sewer line replacement process. At Nu Flow St. Louis, we have invested in the innovative Nu Drain pipe lining system to rehabilitate the pipes without the need to dig. Not only is it the most sensible solution for sewer pipe repair, it is the most cost-effective method. We begin the process with a sewer camera inspection. Our specialized video sewer cameras are the best way to assess the condition of your sewer pipeline in real-time, allowing our trained technicians to identify the exact location of the damage within the pipes. Next, we will use an advanced machine to insert an inflatable tube coated in a liquid epoxy resin into your pipe, through a small access point. Once we have placed this tube precisely, our technicians will then inflate the tube, which coats the interior walls of the pipe with the resin. Finally, we will deflate the tube, remove it from the pipeline and leave it to cure. Once it hardens fully, the epoxy seals any flaws inside the existing line, forming a durable new pipe that will last for decades — all while resisting future damage such as cracks and leaks. Convenience: In the past, even small-scale problems often took weeks to resolve because of the nature of the excavation and work required to even expose the pipe before it could be worked on. Our sewer line replacements can be finished within a single day, making the process more efficient. Affordability: Nu Flow St. Louis’s Nu Drain system requires a smaller crew to install, which saves you money. In addition, you will continue to save money over the years to come as your new sewer line continues to work flawlessly. Sustainability: Trenchless sewer repairs are kinder to the environment because the process requires less fuel to be installed, and by mitigating damage to the soil and surrounding plant life, the process is safer as well. At Nu Flow St. Louis, we have proudly served home and business owners throughout the St. Louis area since 2012. We have specialized in trenchless pipe repairs since the industry first began to evolve in the mid-1990s. We have continued to contribute to the industry by pushing the boundaries and developing new advancements that have further improved the efficiency and affordability of the trenchless method. When you trust Nu Flow St. Louis for your pipe repair, you’ll have the peace of mind that comes with knowing we will fix your pipes with the highest-quality materials and most cutting-edge equipment available today. Call us to see why our trenchless repairs are the first choice for property owners in St. Louis.